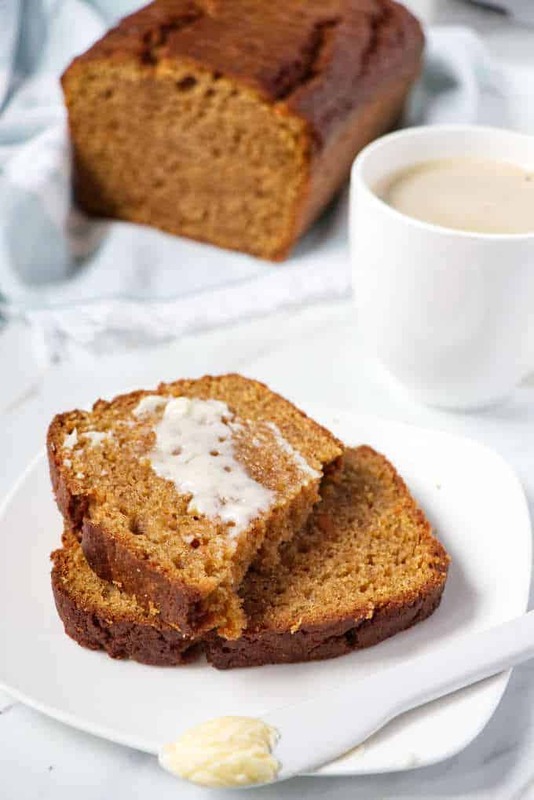 There is just something so delicious and comforting about a good sweet potato bread recipe. You’re going to love the delicious aroma wafting through the home as the bread bakes. The warm spices and tender, moist bread will please even the pickiest of eaters. 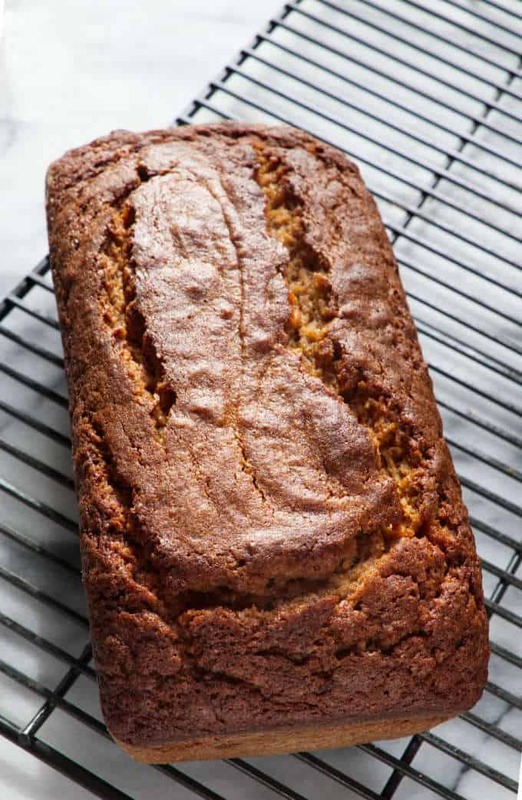 The funny thing is, that while sweet potato bread is a classic, it is often left by the wayside as people make zucchini, pumpkin and banana bread in its place. 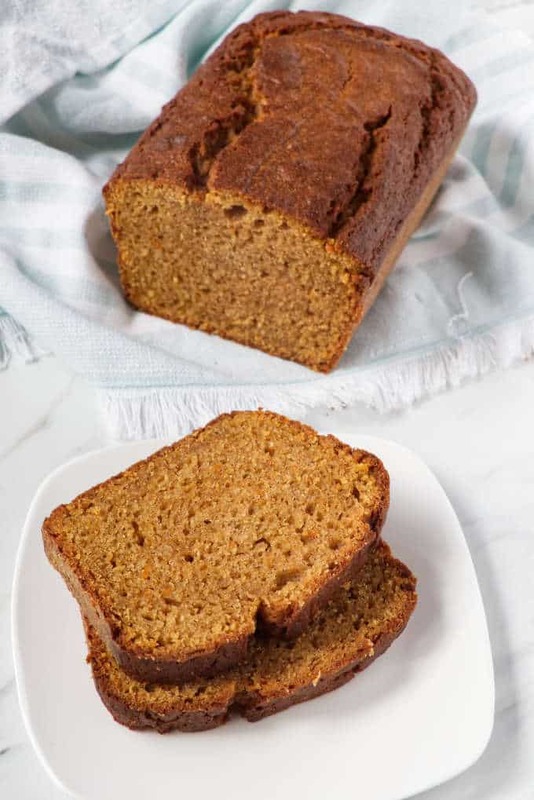 While there is a time and place for those other breads, the time for sweet potato bread is now. 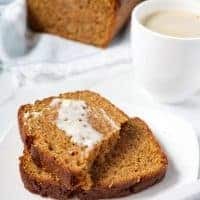 During the cool fall months, or over the cold winter months, this bread is the perfect accompaniment to your morning coffee, afternoon hot apple cider or evening glass of wine. It is so versatile, it can even be served for dessert. You will need just a little less than one pound of sweet potato. Generally speaking 1 large sweet potato or 2 small sweet potatoes should do the trick. To cook your sweet potatoes prior to mashing you will want to either bake them, microwave them or boil them. Preheat the oven to 400 degrees and poke holes in the potatoes with a fork, put on a baking tray and cook for 50-60 Mins until soft. Using a fork, poke holes in the potatoes and put microwave them for 6-10 minutes or until soft. Peel the sweet potatoes and slice them into quarters. Boil water on the stove top and place potatoes into the boiling water. Boil for 5-10 minutes and then drain and pat them dry. The nice thing about baking or microwaving the sweet potato is that you don’t have to worry about peeling them before cooking. Just cook the sweet potato with the skin still intact. After the sweet potato is soft and tender, let it cool down enough so you can handle it then slide the skin right off the potato. It is so easy! You can substitute canned sweet potatoes whenever possible to avoid further prep, making it an even easier recipe to make. 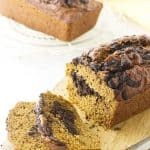 While this bread recipe is basic, adding cinnamon and nutmeg help to give it a warm and comforting flavor profile. Always remember to avoid over-mixing your sweet potato bread batter. Over-mixing will cause it to be dense and overall unpleasant to eat. Make sure to mix the ingredients gently and just until they are combined to ensure your sweet potato bread remains soft and fluffy. 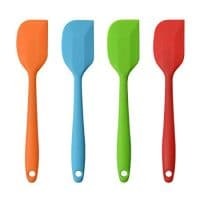 The best way to avoid over-mixing the batter is to use a spatula like this one to fold the flour into the wet mixture. If you use an electric mixer, you are almost guaranteed to over-mix the batter. Be sure to watch the timing of your loaf, not all ovens are the same temperature. Check your loaf with a toothpick by inserting it in the middle. If the toothpick comes out with only a few crumbs on it, your loaf is ready to remove from the oven. Let your bread cool before slicing it by placing it on a wire rack. Cutting into it while it’s still too hot can cause it to crumble and leave you with uneven slices that fall apart. I have to admit it is hard to wait for the bread to cool down all the way. I usually end up slicing it while it is still a bit warm. It is definitely more delicate to cut when it is warm but I’m a sucker for warm sweet potato bread. If you’re in the habit of scooping your measuring cup into the bag of flour, you are going to use too much flour. One cup of all-purpose flour weighs 120 grams or just over 4 ounces. When you scoop flour right from the bag, you end up packing the flour into the cup and you can get twice as much flour than you need. The best way to measure the flour is to use a scale. If you don’t have a scale then lightly spoon the flour into the measuring cup and level it with a knife. 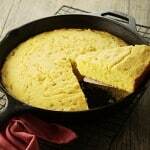 What Size Pan Should I Use to Make This Sweet Potato Bread? 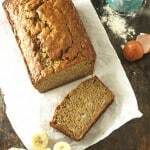 You can use either an 8×4 or a 9×5 loaf pan to make this recipe. Keep in mind that if you use the larger loaf pan, more surface area will be exposed to the heat and it will bake faster. The larger pan will also make a shorter loaf. 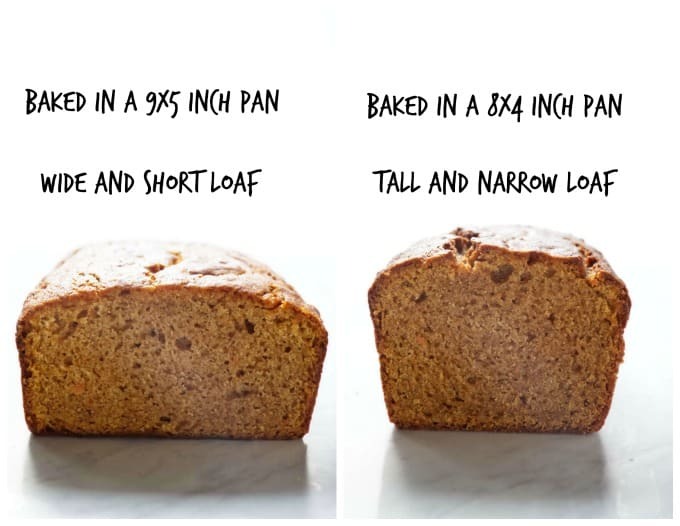 The picture below shows a comparison of what the bread looks like when it is baked in an 8×5 pan and a 9×5 pan. If you want a tall loaf with a darker, crisper crust, use the smaller loaf pan. If your oven tends to run a little hot then you might need to put some tin foil over the loaf for the last 10 minutes of bake time. Results of sweet potato bread baked in different sized loaf pans. Heat oven to 350°F. 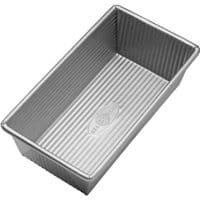 Grease either a 8x4 or 9X5 inch loaf pan. Grab a large bowl. Stir the oil, eggs, mashed sweet potato, sugars and vanilla together. Sift the flour, baking powder, salt, cinnamon and nutmeg over the wet mixture. Fold the ingredients together until they are well combined but do not over-mix. It is ok if the batter is a little lumpy. Bake in the pre-heated oven for 50 to 60 minutes if you use a 9x5 inch pan or an extra 10 minutes if you use a 8x4 inch pan. Check the bread with a toothpick. When a toothpick inserted in the middle comes out with just a few crumbs on it, it is done. Cool in the pan for 15 minutes then remove the bread from the pan and let it cool on a wire rack. You will need a little less than one pound of sweet potatoes, usually 1 large or 2 small potatoes. You can used canned sweet potatoes if you can find them. For fresh sweet potatoes, there are a few ways to cook them. If you cook them in the oven, heat the oven to 400°F. Stab the potatoes with a fork a few times then stick them on a baking tray. Bake for 50-60 minutes if you use a 9x5 inch pan or 65 to 75 minutes if you use an 8x4 inch pan. If you cook them in the microwave, stab them with a fork a few times and cook them in the oven for 6 to 10 minutes or until they are soft. After the sweet potatoes are cooked, the skin slides off very easily. If you want to cook them on the stovetop, peel them first then slice them into quarters. Toss them in a pot of boiling water for 5 to 8 minutes then drain them and let them and pat them dry with paper towels.